That many of them [the missionaries] are often ignorant, narrow-minded and bigoted, as Pearl Buck has the good sense to point out… . While the missionaries come avowedly to save heathen souls for the glory of God and as an obligation they owe to some one in heaven, Pearl Buck can look a Chinese boy in the face and love him without remembering that he is her cousin by virtue of a theological myth. 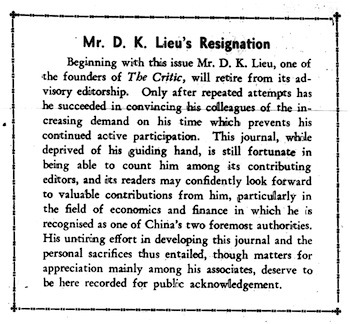 In one of the extracts from The Times Pearl Buck charges Kiang with being an 'ignorant intellectual' of a kind that denies China's problems and is arrogantly ashamed of the poor—the kind of 'chauvinist' faux patriotism that she would later describe in her speech, 'The New Patriotism', in October (see below). 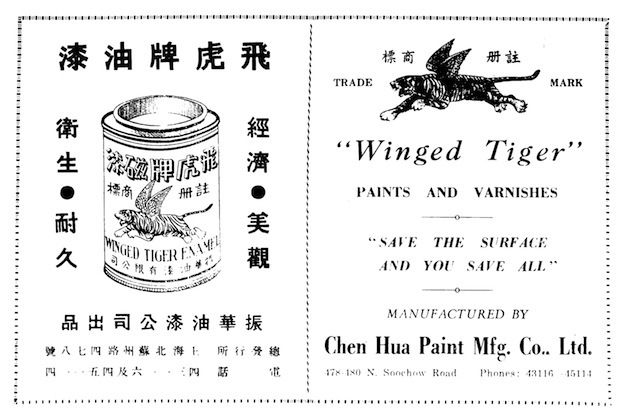 Kiang Kang-hu would later achieve notoriety as a functionary in the collaborationist regime led by Wang Jingwei 汪精衛; he died in prison in Shanghai, in December 1954. 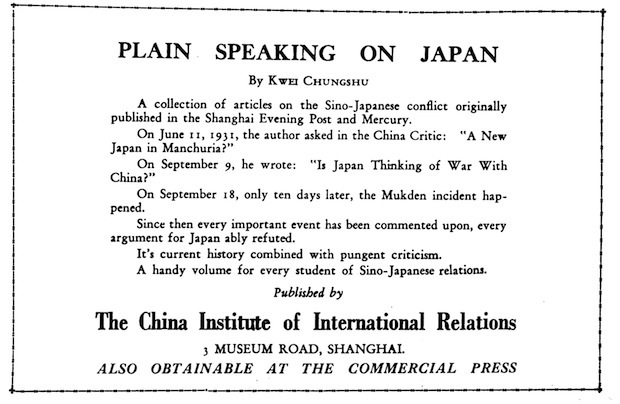 In his special article 'An Appraisal of Chinese Newspapers', which originally appeared in the English supplement to the University newspaper Nankai Weekly, Chen Chin-jen 陳欽仁 discusses the importance of the newspaper to modern society as well as the quality of the Chinese press. Most [Chinese newspapers] do not have the slightest inkling of the all-important truth that journalism is both a science and an art; they apparently believe that anyone who knows how to read and write can be a successfully journalist… . Unless, therefore, this erroneous notion is got rid of, Chinese journalism will find it most difficult, if not impossible, to surmount the obstacles besetting its road of progress. When they are angry with the rickshaw coolies, for instance, they would call them Chu Lo [豬玀]—pigs—or even kick them from behind. But when they are writing a learned dissertation on the Standard of Living of the Rickshaw Coolies in Shanghai, they would sentimentally refer to these poor fellows as “our hard-working and much oppressed brethren and comrades”… . Who are the true Chinese? That is our question. If we may trust Bertrand Russell and Mrs. Pearl Buck, they are certainly not to be found drinking Martini cocktails in the drawing rooms of the Shanghai élite. When will China be affected by movements of this nature can only be a matter of conjecture at present. It seems that while we have been rather fast in accepting abstract doctrines or government and social organization … we have been unusually slow in accepting anything that will materially raise our status as to health and ability to cope with the present difficult situation. Through the former medium, Mrs. Buck portrays China to the western nations just as many other foreigners do, except that her work as a piece of literary art is far more valuable than that of the 'traveller-writers.' Through the latter medium, Mrs. Buck informs an ignorant public of the real existing conditions with regard to the missionaries in the Far East… . Mrs. Buck has been a constructive critic; and as to seeking publicity, why, Mrs. Buck has plenty as a novelist without looking further for it! A second version of 'The New Patriotism', an important and celebrated essay by the American novelist Pearl Buck, appears in this issue, based on an 4 October address that she gave at a reception celebrating her return to China. New Patriotism is also a reaction against a particular kind of chauvinism found in those who would call themselves of 'patriots', who 'will not acknowledge that anything in his country is wrong … [trying] to hide the very faults he knows instead of changing those faulty conditions.' Born of shame for poverty and wretchedness, such chauvinism leads to a lack of understanding and empathy between the wealthy and the poor. Of course, nobody would believe you, least of all the Chinese girls themselves. Miss Pan, who led a boycott against you in Peiping, says of course you are sarcastic. Of course you a joking, and—this is what makes it unbearable—you are mocking at them… . No, M. Dekobra, we have been so bullied and bamboozled and disheartened that we can't believe anybody who says a good thing of China… . Of course, you know what I have been driving at. The phrase 'inferiority complex,' trite as it is, involuntarily crops up.